More than forty years ago, I visited my second cousins in “Pleasant Valley,” Arizona. While I was there I had one of the most memorable meals of my life, biscuits and beef jerky gravy served with a side of fresh pinto beans. 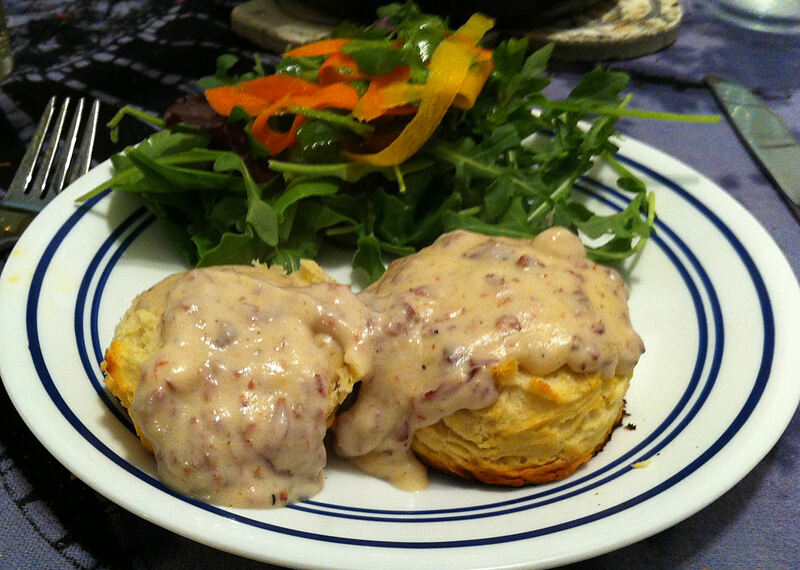 While biscuits and gravy is a standard Southern/Western dish, I have never had—before or since—as good as I had that day. Note: While “Pleasant Valley” is what I was told was the name of the place, I have spent hours in Google Maps trying to find this Shangri-La of the West. It might be Young, Arizona, but if it was it has expanded greatly over the years. Our goal was the ranch that had been settled by the family in the early days of the 19th century. My grandmother had been the teacher at the “literally” one room schoolhouse when she was young. It was claimed, by my cousins, that Zane Grey had stayed at the ranch while he was writing Riders of the Purple Sage and that the ranch’s original stone cabin (still standing) was described in the book. Ranching at that scale is not terribly profitable, so every summer the men folk of the family went out and took road and construction jobs to make enough money to keep the ranch afloat. During the winter, everyone came back to live the life that for most of America is long gone. These folk were doing their best to live the life of their pioneers and cowboy ancestors. While they sold most of their cattle, they did save one or two for family consumption. One of the events of my stay was to help skin out and butcher a steer. Much of the meat was jerked for preserving, because even a single steer produces too much meat to just throw into a freezer. Most of the rest of their food was grown in their large kitchen garden. If they had pinto beans, they had been picked that morning from their field. The recipes they made reflected this pioneer spirit. Note: It is virtually impossible to replicate the fresh pinto bean dish. You basically have to have your own field of bean plants to harvest—as they did. I have never seen fresh pinto beans at any farmer’s market or organic store. If you can get fresh garbanzo beans, why can’t you get fresh pinto beans? While they did not give me their recipe, I have done my best to replicate it. All I had to do was think—“I’m a pioneer: What do I have on hand to make this dish?” I have taken some liberties in technique, but I have tried to keep the ingredients list to what they might have had in their pantry. 1. Grate the jerky into fine bits. Tip: I am sure that my cousins did not have a food processor, so I am pretty sure that they used a box grater. Note: The flavor of your gravy is entirely dependent on the quality of your beef jerky. My cousins jerked their own beef, while I had to use a commercial brand. Discussion of the topic on-line suggests that you really need to make your own jerky. I am forced to agree—while my gravy was good, it was not the amazing gravy of my memory. 2. Put the jerky shreds in a small bowl and add half a cup of boiling water. Let the beef steep for half an hour to rehydrate. Tip: While the beef jerky is soaking, make your biscuits. 3. Sift the flour, baking powder, salt, and sugar several times into a large bowl. Tip: Repeated sifting helps distribute the ingredients evenly through the mix. Note: Self-rising flour is not commonly available in the US. So the repeated sifting is an attempt to get s-r flour even distribution of salt and baking powder. 4. Using a box grater, grate the frozen butter into the flour mixture. Tip: Stir the butter shred into the flour so that they do not clump together. 5. Use a pastry cutter, to break the butter shreds into tiny bits. Tip: Many recipes have up use a pastry cutter on large lumps of butter. While this eventually works, the heat created by repeated chopping starts to warm the butter. With the frozen butter shreds you only have to chop the butter a few times to get a through mix. 6. Preheat the oven to 425º F.
7. Add most of the milk to the dry ingredients and use a spatula to combine them. Tip: If necessary, add a bit more milk to make a soft dough. 8. Turn the dough onto a lightly floured surface and knead 10-15 times. 9. Roll the dough to one half inch thick and cut the biscuits out with a 2 inch biscuit cutter. 10. Place the biscuits on a lightly greased baking tray and brush the tops with the remaining milk. 11. Bake the biscuits at 425° F, on the middle rack, for 12 minutes or until golden brown. Tip: While the biscuits are baking, finish the gravy. 12. Melt the butter, over a medium heat, in a small pot and add the flour. 13. Cook the roux until it is a medium brown, about 8-10 minutes. 14. Stir in the jerky and all of the soaking liquid. 15. Add most of the milk and stir frequently until the gravy thickens. Tip: After five minutes of cooking, decide if you need to add more of the milk to get the consistency you desire. 16. Stir in the pepper and add salt, if necessary. Tip: Some jerky has a lot of pepper and may be very salty, taste your gravy before adding any pepper or salt. 17. Diners split the hot biscuits and pour the warm gravy over them.